There have been major advances made in the materials for Flat roofs, RV roofs and low slope roofs in the last twenty years. 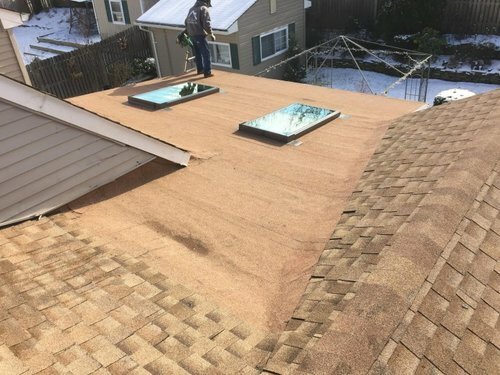 Keystone Contracting LLC has comprehensive knowledge in new and traditional flat roof materials as well as the latest liquid roof products on the market today. (See Roof Coatings) If you need flat roof installation, restoration or flat roof repairs, we could offer you a solution that will provide you with a protective, water-proof roof, minimizing your maintenance and energy costs. If you have a flat roof that needs water-proofing, need flat roof repair or flat roof sealing, contact the Keystone Contracting LLC. We have extensive experience with commercial flat roofs as well as residential flat roofs. Keystone Contracting LLC is unsurpassed in the industry in roofing a flat roof. Call us and we will recommend a course of action and the right flat roof product for your building.